Food safe, and delicious, fried turkey on a table with other Thanksgiving sides. Thanksgiving Day is full of family get-togethers, giving thanks, lots of food and some turkey deep frying horror stories. From homes burning down to turkeys skyrocketing into the air, safely preparing and frying a turkey doesn’t have to be dangerous. 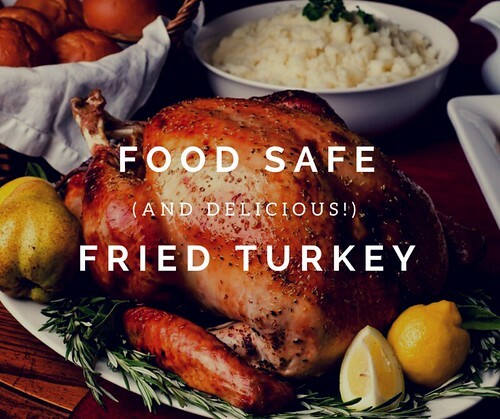 To avoid becoming one of these Thanksgiving Day horror stories, and to make sure you fry that centerpiece safely to avoid foodborne illness, USDA offers advice on properly preparing and frying your turkey safely. There are few things to remember before, during and after you fry a turkey. if bought fresh: keep in the refrigerator (40 F or less) and cook within 1-2 days. If bought frozen: it takes 4-5 pounds per day to thaw safely in the refrigerator; for a 12 pounder it will take 2.5 to 3 days in the refrigerator to thaw, then cook within 1-2 days. Smaller birds work best for frying. The turkey should be no larger than 12 pounds – or you can fry parts instead, such as breasts, wings or legs. It should be fresh, completely thawed and not stuffed. If you bought the frozen turkey and don’t have time to thaw it in the refrigerator before the family dinner, use our quick-thaw, water method: submerge the frozen bagged bird in cold tap water, changing the water every 30 minutes so it continues to thaw. Small packages of meat, poultry or seafood — about a pound — may thaw in an hour or less. For whole turkeys, estimate about 30 minutes per pound. So a 12-pound bird will take approximately 6 hours with this method. Remember, when thawed completely, the food must be cooked immediately. For more, see our Big Thaw fact sheet. When working with large amounts of hot oil, select a cooking vessel large enough to completely submerge the turkey without it spilling over. The oil should cover the turkey by 1 to 2 inches. Select a safe location outdoors for deep fat frying a turkey. Heat the cooking oil to 350°F. Very slowly and carefully lower the turkey into the hot oil. Monitor the temperature of the oil with a thermometer during cooking. Never leave the hot oil unattended. Allow approximately 3 to 5 minutes of cook time per pound. When reaching approximate time needed, check to see if the turkey is safely cooked by removing the turkey from the oil, draining the oil from the cavity and with a food thermometer, check the internal temperature of bird. DO NOT test the temperature while the turkey is submerged in oil. The turkey is safely cooked when the turkey reaches a minimum internal temperature of 165°F in the innermost part of the thigh and wing and the thickest part of the breast. If the turkey has not reached 165°F in all three locations, then return it to the hot oil for additional cooking. When the turkey reaches 165°F, remove it from the oil and place it on a sturdy tray lined with paper towels. The skin can range in color from golden to dark brown to almost black. Let it rest about 20 minutes before carving, to let the juices set. After dinner, remember to follow the 2-hour rule. For safety, do not leave the turkey or other perishable foods sitting out at room temperature longer than 2 hours. Slice leftover turkey and place in a shallow container and store in the refrigerator for 3-4 days or freeze for longer storage. For more information on the recommended types of oils to use and cooking times for various cuts of meat and poultry, read Deep Fat Frying and Food Safety. If you have additional questions about using your leftovers safely, you can call the USDA Meat & Poultry Hotline at 1-888-MPHotline (1-888-674-6854) or chat live with a food safety specialist at AskKaren.gov available from 10 a.m. to 6 p.m. ET, Monday through Friday, in English or Spanish. Don't forget to check the fill level of the pot before heating the oil. Test with water first to determine where to put your oil. Filling up the pot and inserting the bird can have detrimental effects, and trying to remove 400f oil from the container as it fills to overflowing isn't nearly as easy as doing so when it's cold.